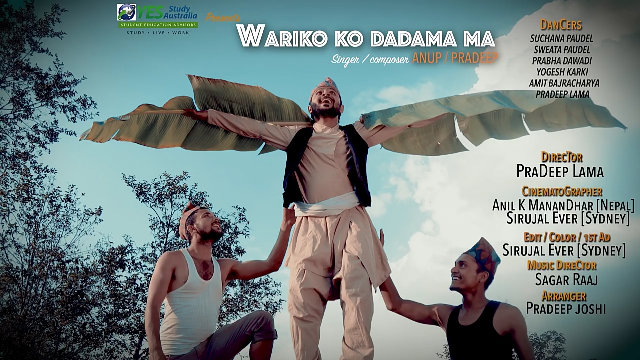 Ojha, Lama come out with debut "Wari Ko Dadama Ma"
Kathmandu – Journalist Anup Ojha has another feather in his cap. He has come out with his debut music video "Wari Ko Dadama Ma" released recently. Produced by YES Study Australia, and presented by The NEXT based in Australia in collaboration with Sagar Raj Film, the song is composed and sung by Anup Ojha and Pradeep Lama. screenplay is written jointly by Saagar Raj (in Nepal) and Amit Bajracharya (in Sydney). he Kathmandu Post English daily. As a journalist, Ojha has long experiences of writing music reviews, covering concerts, interviewing famed artists and celebrities from both national and international arena. He is also a theater artist, a student of Nepali theater veteran Sunil Pokharel.